I recently did some hauls and so thought of reviewing on of them for you all. 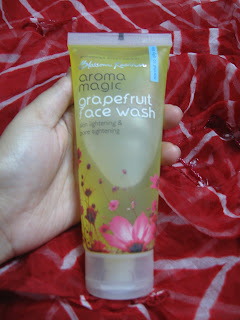 Okay so I finished off with the Aroma Magic Neem Face Wash and had a mixed feeling with it. 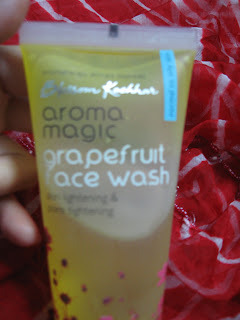 So some time back I was in search of an alternative face wash as I was not interested in continuing with the Neem Face Wash and came across this Newly Launched Face Wash from Aroma Magic called the Grapefruit Face Wash. Ingredients: Aqua, decyl glucoside, cocamidopropyl betaine, olive esters, cymbopogan martinii oil, aloe barbadensis leaf extracts, grandis seed extracts, citrus medica limonum extracts, fruit derieved beta carotene and citrus aurantinum oil. ( Most of them sounds like Hebrew to me). Price: Rs. 125/- for 100 ml. Claim: 100 % free of paraben, soap, alcohol, artificial colouring & fragrance. Cleans, lightens & brightens skin with grapefruit, lemon & aloe vera extracts. Tighten Pores with Vitamin C and beta carotene. 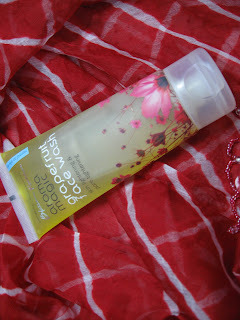 Mattifies and revitalises skin with blend of palmarosa and neroli oils. Aroma Magic has recently changed its graphics on the packaging which is quite eye catching and I fell prey of its new packageing. Well I've been using this face wash twice a day for the past 2 weeks or so. The first thing I noticed was that it left my skin squeaky clean. It has a light citrusy smell but nothing overpowering. The smell is quite refreshing to me. The colour of the face wash is light lime. The consistency is just right. The tube is semi opaque that lets us see the product left in it. The impressive point till now is that I didnot have any breakouts or rashes on my sensitive area (forehead). But one Caution mentioned in the tube is that mattifying sunscreen during the day is essential and NOT recommended for DRY SKIN. Well while buying I was not aware of the caution and was quite sceptical to use it as most of our's skin tend to become dry in the winters. But I've not yet have had any problem. Now suming up, I really like the product and think it's a quite impressive product and does full fills most of the claims. Not 100% satisfied with all the claims (although nothing serious cons). Good article, I'm going to spend more time learning about this topic.